Can I slow down or speed up the teleprompter speed? Yes! You can easily speed up or slow down the scroll rate of the teleprompter. Using the slider, simply set the slider position by scrolling. Run a quick test to check that you have selected your desired speed. The speed will remain constant while you record. With this feature enabled, your text will stop scrolling when you are silent. Use this to take meaningful pauses, to emphasize a certain point, or simply take a short break to catch your breath while filming. Please Note: if you go off script the script will continue to scroll even if Pause On Silence is turned on. To make sure that Pause On Silene will work seamlessly, use the Reference Noise Level. 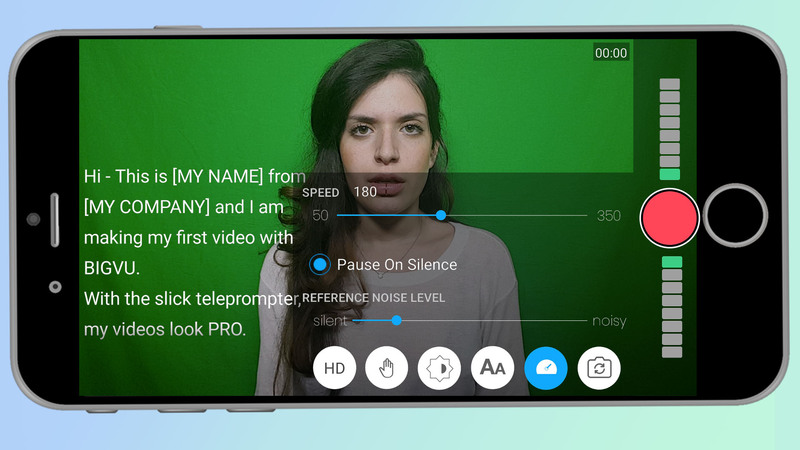 If you are filming in a noisy setting, set reference noise level to noisy, so that the app knows to stop even if there is noise around. If you are filming in a quiet setting, set reference noise level to silent, so that the app stops scrolling only when completely silent.